With less than a month left in the fiscal year, Democrats and Republicans can't agree on whether to preserve, change or eliminate a voter-approved tax increase. AUGUSTA — State budget writers remained at an impasse Friday and planned to propose three competing spending plans – one Democratic and two Republican versions – as talks continue in an attempt to resolve major differences over education funding. With the new fiscal year less than a month away, members of the Appropriations Committee gave up attempting to coalesce behind a single budget proposal. Instead, Democrats are proposing a budget that includes $320 million in additional K-12 education spending, funded through a voter-approved 3 percent tax surcharge on wealthy Mainers. Senate Republicans are proposing a more modest $100 million increase without the tax surcharge, while House Republicans are backing Gov. Paul LePage’s original proposal to eliminate the tax surcharge and provide an additional $19 million to schools. The split – particularly among the two Republican caucuses – highlights the political challenge facing legislative leaders as they work to avoid a potential government shutdown on July 1. Appropriations Committee members and legislative leaders planned to continue negotiations over the weekend. The committee opted to move forward with three separate budget reports on Friday to allow legislative staff to begin the lengthy process of drafting and printing the budget document. Lawmakers cannot simply pass a budget on June 30 to avoid a shutdown. LePage has vetoed several budgets, including the hard-fought compromise in 2015 that also sharply divided the parties. LePage has 10 days to sign, veto or allow the budget to go into effect, meaning lawmakers need to build in at least 10 extra days to override a veto. Lawmakers and political observers have known since November that the 3 percent tax surcharge on earnings over $200,000 that voters approved in a referendum would be the biggest hurdle to passing a budget. Yet the political parties haven’t reached a compromise, and Friday’s statements from legislative negotiators made clear that Democrats and House Republicans have yet to budge from their positions. Sen. Cathy Breen, D-Falmouth, said Democrats have been waiting months for a Republican counter-proposal to the tax surcharge that meets the long-elusive state obligation to pay 55 percent of education costs. But Breen said the $100 million proposal released this week by Senate Republicans – which has been rejected by House Republicans – falls $220 million short of the anticipated funding levels under the tax surcharge. While House and Senate Republicans remain divided over how much additional funding to direct toward education, the caucuses are united over eliminating the 3 percent tax hike on Maine’s wealthiest residents. Democrats have been holding firm in their insistence that the Legislature either preserve the tax surcharge or find another way to hit the 55 percent funding target approved by voters more than a decade ago. Yet they also will be under pressure to avoid shuttering state offices, an event that has not occurred since 1991 when a dispute over workers’ compensation led to a two-week shutdown. Maine’s Constitution requires a balanced budget to continue operations. LePage vowed this week to veto any budget that provides additional K-12 funding without some of the education “reforms” contained in his original, $6.8 billion budget proposal. Those changes include a statewide teacher contract as well as halting state aid for school administration costs, which is part of the governor’s push to reduce the number of superintendents and administrators statewide. Senate President Mike Thibodeau, R-Winterport, said his caucus’s $100 million proposal includes “significant” education reforms, many taken from the governor’s budget. However, there is a robust policy debate over what can be used to calculate the state’s share in order to hit 55 percent. Democrats have accused Senate Republicans of attempting to change the formula by including the unfunded liability of existing teacher retirement debt in the calculation for the first time. Republicans say they are following statute. The Democratic minority leader in the Senate, Sen. 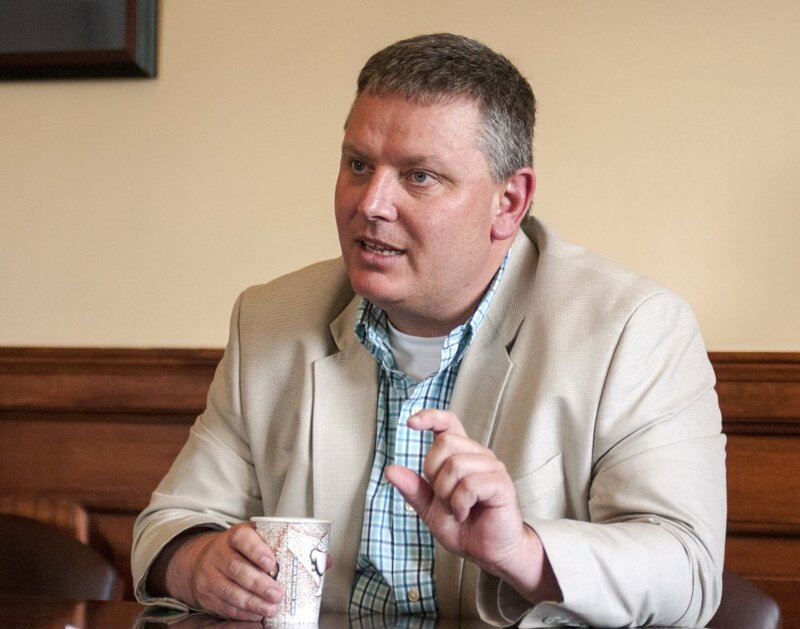 Troy Jackson of Allagash, said Republicans “are trying to fake their way to 55 percent” and, in the process, are passing along additional costs to local taxpayers.